Wine and Pop: Is Jesse Plemons Secretly One of the Greatest Actors Of Our Time? Is Jesse Plemons Secretly One of the Greatest Actors Of Our Time? Friday Night Lights’ “Underdogs” is one of my favorite television episodes in the history of the medium. It’s packed with indelible performances, from Riggins and Saracen’s encroaching nostalgia over their last game, to Coach’s locker room speech, somehow more inspiring than any before. The centerpiece of the episode is a speech, in the form of a college admission essay, by Adrianna Palicki’s Tyra. Her words are set to a gorgeuous montage of every character. As it concludes, we return to the hotel room with Tyra and the man who loves her, Landry (Jesse Plemons). Plemons isn’t given much to do; this is Palicki’s moment to shine (and shine she does). But it’s impossible to forget Landry’s presence here. His quiet listening, attentive, welling eyes, and subtle reassurance are powerful in their own right. Plemons has plenty of great showcases of his own throughout the series (whatever one thinks of season two’s ridiculous twist, Plemons absolutely kills throughout the plot), but this performance highlights how minute of a job he can be given without losing any sense of grace. He’s not a flashy actor, about as far from that as one can get, but Jesse Plemons may secretly be of the best actors of our generation. 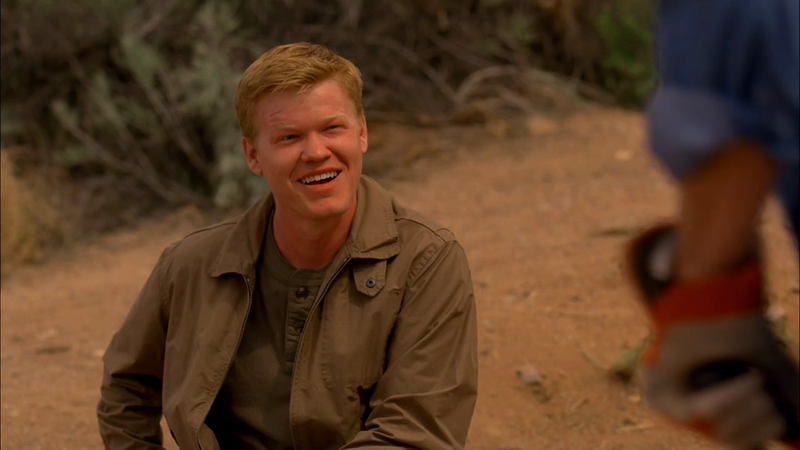 There’s a reason that fans of both Friday Night Lights and Breaking Bad squealed in delight after finding out that Plemons would be appearing on the latter show (Maybe I am the only one who squealed. I am content with this.) He quickly differentiated that show’s Todd from FNL’s Landry Clarke, though subtly. They are both ambitious young men in the American Southwest. Where Landry had Crucifictorious, Todd has a train heist. Both men want desperately to prove themselves, however different their methods may be. Even before the mind-warping and soul-crushing twist at the end of that heist, Plemons had begun to create a fully formed being out of a fairly flat character. His obvious adoration for Jesse Pinkman and Walter White set the stage for that episode’s close. Todd was clearly going to follow Walt’s instructions, if only for the sake of furthering his own cause. In the opening of the next episode, after a heartbreaking montage devoid of dialogue, Todd speaks up, with a callousness and detachment worthy of a psycopath. The boy clearly ain’t right, and this doesn’t stem solely from his actions. Later in the episode, Todd smiles, holding an incriminating tarantula in a jar. Again, it’s a quiet scene, which could easily be completely forgettable in a lesser actor’s hands. But Plemons forces an intensity, showing the insanity oozing through the skin of the man we once knew as Landry. Jesse Plemons has even less to do in The Master, Paul Thomas Anderson’s latest masterpiece. He plays the son of Philip Seymour Hoffman’s cult leader, unconvinced by his father’s teachings. His blatant flippancy is highlighted in a scene with Joaquin Phoenix, a devoted follow of Hoffman’s “religion”. Phoenix’s performance is one of the best I’ve ever seen, played with a manic energy and an unhinged physical derangement. It would be easy for anyone but the best performer (i.e. Hoffman) to be swallowed by Pheonix’s energy, but Plemons holds his own, though the scene may be short. Throughout the film, Plemon’s mostly stays in the background, slowly becoming fed up with the insanity of those who believe his father. Phoenix is the ultimate believer, and their brief confrontation utilizes the subtle nature of Plemons’ skill. He tells off Phoenix with a complete disregard for his faith. Val, Plemons’ character, isn’t crazy, like Breaking Bad’s Todd, or awkward in the vein of Landry Clarke. Val is tired, wary of the cult he’s forced to live within, though not inspired enough to set out on his own. Plemons may never win any great awards or accolades for his work. He doesn’t give the large performances that win Oscars, and if the Emmys ignored his work on Friday Night Lights, there’s little chance that they’ll ever come around. He, sadly, may not ever be recognized for what he brings to everything he does. Because what he brings is detail. Jesse Plemons is a subtle performer; so subtle in fact, that calling him one of our greatest actors seems unfair. It seems too obvious a thing to say for someone who clearly doesn’t know what obvious means. I totally agree with everything you said here. He is great and now on Fargo, I was completely amazed when he showed up on Fargo, he was the innocent looking person who plays someone really evil and does it the best. I just remembered, wasn't also the mean husband on Olive Kitteredge, another great performance. He married the little pharmacy assistant.